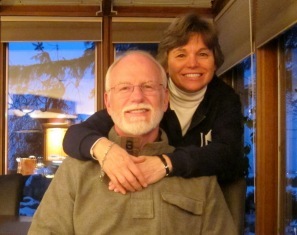 I was born in Decatur, Illinois, on January 9, 1954, to Thaddeus and Elsie Porowski. I am told it was about zero degrees Fahrenheit and very windy. My dad was a chemist at the time, and my mom a housewife busy with my two older sisters Anne, born in 1950, and Irene, born in 1952. Our family never had too much money when I was growing up. Because of this and other pressures in our family we lived sometimes with joy and often with heartache. Please note that I am not a writer. Nor have I set out to impress anyone with what I have or have not accomplished in my life. I simply want to write of my life, what it was like to grow up in the suburbs of Chicago, and how, even there, God sought me and got hold of my heart. I hope you find it worthwhile reading! My dad was born in Chicago, Illinois, the son of Polish immigrants Peter and Mary Porowski. 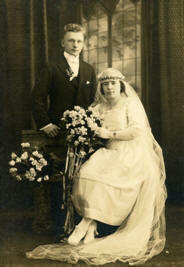 They came from Poland, settled in Chicago, met each other, and married in 1920. My dad was born in 1921. His family was very poor financially, which only got worse after the Great Depression of 1929 hit. 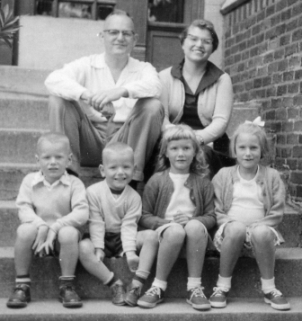 My mom was the daughter of Methodist missionaries Paul and Marie Dibble. Paul’s family had a line of ministers and missionaries, beginning in the state of New York after the American Revolution, and then moving westward to Illinois, Wisconsin, and finally to South Dakota. We can actually trace our mom’s family roots back to a man named Henry Samson who came over on the original Mayflower ship in 1624 from England to Plymouth, Massachusetts. Marie was born in Denmark to a Godly family and grew up with the desire to be a missionary to India. She moved to Chicago when she was young, and then to South Dakota where she met Paul. They got married in 1923 and left on a ship for India the same day to be missionaries there. My mom was born in India in 1924 when my grandparents were living in Madras and my grandpa was running a school. While home for a rest in Illinois, the Great Depression hit, and so my mom’s family was forced to abandon their plans of returning to India. My grandfather became a Methodist minister and served in that capacity for the rest of his life. 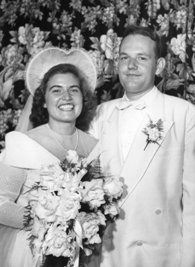 Mom and Dad met while attending university, and were married in Chicago in 1949. Dad had been raised Catholic, but did not pursue God or have a relationship with Him. He was asked by my mom’s parents to become a Methodist if he had any hope of marrying my mom. He became a Methodist and they married. His Methodist days were short-lived. For example, my mom never heard him swear until after the ceremony the day of their wedding. But to their credit they stayed together all their lives despite the struggles they had. They settled in central Illinois after their wedding, living in several different towns before moving to Decatur, where I was born. In the summer of 1954 my family moved to Wheaton, Illinois, a small town west of Chicago where much Christian activity was taking place. My brother Jim was born half a year later in January, 1955. We spent the next twelve years of our lives in Wheaton. It was “the best of times and the worst of times.” My dad was a very impatient man, and not wise or loving in discipline. So we grew up being disciplined, based not on when we needed it but on my dad’s emotions. We did not have a relationship with my dad. He did not know how to love. My mom loved us much. She tried her best through our growing years to raise us as good Christians. We went to church almost every Sunday. Mom loved music. She majored in music at college and taught piano lessons from time to time to earn some extra money as we grew up. Sometimes she had as many as twenty students. On Sundays she sang in the choir at the church. We didn’t like going to church much, but we didn’t put up much of a fight, and we loved and respected Mom because she treated us well and gave us “protection” from Dad. And since Grandpa and Grandma Dibble were in the same church, we had many eyes watching our every move, so we simply cooperated. When we moved to Arlington Heights and began attending the United Methodist Church there, we kids usually sat by ourselves up in the balcony at the back of the church meeting room while my mom sat with the choir at the front. The balcony was a second floor that ran from the back of the church meeting hall to about two thirds from the front. So my brother and I often joked and giggled and snickered during the whole service. I thought I would blow my eardrums out at times when I had to plug my nose and mouth to keep from laughing out loud. What an annoyance we must have been to everyone! Jim and I loved sports. We loved to cut through the backyard of the neighbors behind us in order to get over to Emerson Elementary School to play baseball, football, or anything going on. We grew up fairly independent at heart. We dreamed of being professional baseball players. We kept all the statistics (stats we called them) on the Chicago Cubs baseball team. We practiced baseball every chance we could get. We loved the Chicago Bears football team as well. We played every fall, and even into the winter when we played slow motion football in the front yard after huge snowstorms, tackling each other, pretending it was some important professional game, and dreaming of glory. Somehow we had enough money to own a football and a baseball mitt and ball, and with those things we grew up. At times we didn’t have enough money, and so one time in particular we stole a catcher’s mitt and some baseballs from the Hergonrother house three doors down from us. It was like discovering a gold mine! We had to confess and return the stuff several days later, much to our disappointment. I remember that when I was about nine years old I jogged two miles to town just to get exercise. I often did that kind of thing. I had a goal when I was ten to be the first man to run the mile in three and a half minutes. I never made that goal, but it was something I strived for. We also loved gym class at school. We loved to roller skate in the basement of our house in the winter, since it was an open basement with lots of space. We grew up being very competitive. I am not sure of all the reasons that some kids are so competitive and others not. Perhaps it is the fact that we were not loved by Dad at home, perhaps because we didn’t have much money and things were hard, and perhaps we simply had that unexplainable drive to win so common to men and women. Across from our house in Wheaton was an empty lot belonging to the church that met on the corner of the block. We called the lot “the prairie” because it seemed so huge at that time. You can see it in the photo to the left. My brother and I used to play baseball or football over there. And often in the summer, when we were bored and the weather was hot, we would go over there to do whatever seemed interesting at the time. One time we were playing with matches and making fires, and one got out of control. Not knowing what to do, we ran for home as fast as we could. The fire must have gone out, though, because when we took a look sometime later the grass was still there! All of us kids took piano lessons from a lady named Miss Cromer. She was a tyrant, and we hated every lesson we took. She used to get furious with us (even though I don’t think we were too bad! ), and scream and yell. She would often eat carrots or other food while teaching, and when she screamed pieces of carrot would fly onto the piano keys and sometimes on my hands! My dad’s jobs were hard. He was a chemist in the early years, and then became a high school chemistry teacher, first at Wheaton High School, then at Wheaton North High School, and later at Forest View High School in Arlington Heights, Illinois. He was extremely intelligent, but was not good at dealing with students. Consequently they made his life very difficult. He loved to come home and read through the entire newspaper every night. We kids grew to hate this. He spent little time with us. His discipline took the form of hitting us with his hand whenever he got upset with us. No doubt we often deserved it! But when a parent spanks or hits a child when the parent is upset, regardless of whether or not the kid deserves it, it causes the kid to grow up uncertain of things and indecisive as a person. And so it was with me. My mom, on the other hand, was much gentler, and did not discipline us as much. Her discipline was easier to understand. She would generally tell us what was wrong and what to do or not do, and punish us if we disobeyed. I remember several times when I said bad words (though I don’t remember what I said!). My mom literally took me to the sink and washed my mouth out with soap! And she had to do it more than once. But you know what? The lesson stuck with me through my growing years! The seasons brought with them the annual family get-togethers. We had summer visits to our cousins’ home, trips to the Lake Michigan beach and Indiana dunes, yearly visits to see our Grandpa and Grandma Dibble at Thanksgiving and Christmas time were great. At Halloween - October 31 - we went for blocks knocking on people's doors saying “Trick or Treat”, amassing a huge bag of candy, and got home late. It was heaven for us. We also carved pumpkins as a family at Halloween. We would cut a circle on the top of the pumpkin and carefully pull off the top in such a way that we could use it as a lid for the pumpkin. We scooped all the seeds and stuff out of the insides and then carved a face in the pumpkin. Finally we put a candle inside and lit it and turned all the lights out to see the sight. It is strange how customs begin in cultures and continue on long after the meaning has been lost. Though now I am aware of the link between Halloween and the occult, back then it only meant fun and excitement for us. Strange, huh?! Thanksgiving Day is the last Thursday in November. We as a country give thanks for the protection God gave to the pilgrims the first year they were on American soil in 1624, and for the blessings we have received each year. It is the most family-oriented holiday of the year, a very special day in America. As kids we absolutely stuffed ourselves with all the delicious food, and then lay down in the living room groaning because of the stomach pain! Who knows why we would do it again the next year, and the next, and the next?!! And Christmas was best of all! How great to get presents. We put up a Christmas tree each year a week or so before Christmas Day. We covered it with lights, ornaments and silver tinsel to make it glitter and shine. We loved it. The night before Christmas we always set out milk and cookies for Santa Claus, and went to sleep, longing for morning. 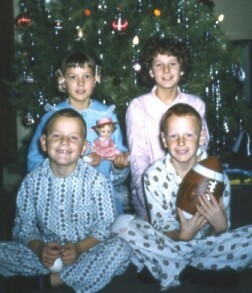 Then as early as we could, we would jump out of bed and run into the living room to see what Santa had brought us. And of course the milk and cookies were gone! As I have said, we didn’t have much money as a family, so our presents were never very big. But the best of all was that on Christmas Day my Aunt Helen and Uncle Bob would come for dinner bringing the biggest presents of all. Wow! 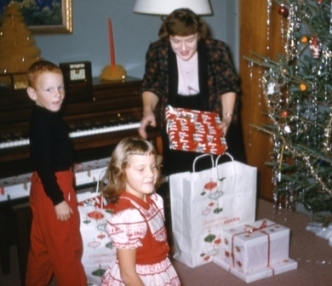 You can see my sister Irene and I in the photo eager to get the gifts my Aunt Helen is pulling out of her Marshall Fields shopping bag! Kids love to get. Mature people love to give! And so it was a great day for us. Our school always did a Christmas program in which we sang Christmas songs for all the parents. It was a big deal. Eventually we learned, of course, that Santa doesn’t exist. And a consciousness of God began to grow in me, little by little, which I shall write about a little later. As far back as I can remember we dreaded doing anything with our dad. Each Saturday he drove from Wheaton to Chicago to visit his parents and spend the day there. We dreaded going. Sometimes we hid in our closet, hoping he would go on his own. If it was determined that we would go, we would seek our mom out and plead with her to talk Dad into not taking us with. Sometimes it worked. How we would love being home when he was gone, because all would be at peace. I remember, though, that when we went with our dad to Chicago I would think about the areas we drove through. 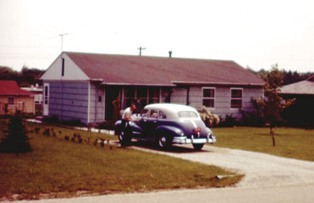 The suburbs of Chicago were generally very organized, clean and nice to look at. Chicago itself, on the other hand, like any urban city , had its good and bad areas, and you can never avoid them no matter how you travel though the city. I would think about the ghettos, the poor people, and the hard life they lived. There was a gentle, sensitive side developing in me during my young years through all the pain and confusion we grew up in. I thought seriously during those years that one day I would go to Appalachia to help those in poverty. From young years Jim and I had a job delivering newspapers in our area. The summers in Illinois are roasting hot, the winters freezing cold. How I dreaded getting out on the cold days that were sometimes minus twenty degrees Fahrenheit, to deliver our papers. It was a bad scene at home if we pleaded to not have to walk the route. But we always lost the fight, and would trudge off, groaning within. My dad and mom never really provided proper winter clothes for us, and consequently we would agonize at times in the cold. I remember one bitter cold day when Dad was particularly mad at us, and insisted we go out. I ended up going by myself, I am not sure why. With no desire to return home, I went to Emerson Elementary School and lay down in one of the entry ways by a wall that broke the bitter blowing of the wind, longing for love, feeling empty, and groaning because of the cold. I grew up selfish in many ways. 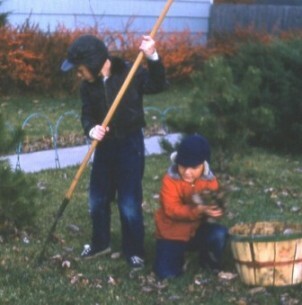 Because I was a year older than my brother Jim, I could generally get my way and choose the better job when there was work to do. I got the best, he got the worst. I know I frustrated him at times, and we got into fights sometimes. But we also loved to wrestle each other and spent many hours with friends playing Cowboys and Indians, Army, and so on, the things boys love to do. My brother and I learned to steal things from stores near us. We never stole more than candy and toys, but we became expert at it. Once in a while we got caught, but we continued stealing. My brother had a winter coat with pockets that continued around to the back. We could fill it with lots of candy. We didn’t steal for the thrill of it like many kids did. We stole because we were poor and almost never were allowed to have candy or cookies at home. The newspaper route that we had was set up such that we were responsible for collecting the money from the homes every two weeks, and then keeping what was left over after paying the newspaper company. My dad never could figure out why we ended up short at times. But we knew because we took the first dollar or two to the store to buy candy before getting home! My dad often had us do jobs that seemed crazy to us. 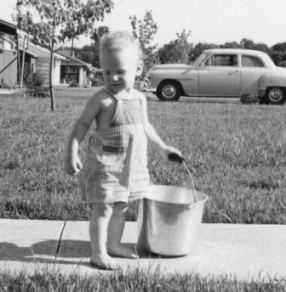 During the summer evenings when all our friends were playing, we often had to pick dandelions. Our yard had tons of them. Something had to be done, but we always thought it was crazy picking the flowers and the seeds, but not getting the weeds themselves or the roots. There are spiritual lessons to be learned in that, because the dandelions kept coming back all the time. My dad would promise to buy us a Popsicle after our work from the man who rode the Popsicle cart through our neighborhood. But he seldom made good on his promise. Perhaps to him it was an insignificant thing, but to us it was something we never forgot. My dad grew up loving nature: the birds, the plants, the woods, and so on. He took us to the forest preserves near our home to pick wild raspberries or blueberries. We loved to eat them, but the trips to the woods were something we all hated! Trips with my dad were such a hard thing. And whenever we went, the mosquitoes were always so incredibly horrible. My brother was most affected by them, and would often come home with welts on his arms or face. My dad was very tuned in to his Polish heritage. He dragged us along to events in Chicago like the annual Polish Parade. Many Polish people live in Chicago to this day. But us kids hated going, and consequently hated anything Polish. America has been populated by people from other countries around the world. The first generation kids born in America of foreign parents are usually very proud of their foreign heritage. My dad was that way. But many young people who live in towns outside the big city see themselves as Americans first, not Italian, or Polish, or German, etc. We considered ourselves Americans, and anything from the “old country” was of no interest to us. Now, of course, looking back, we wish we could have learned more of our heritage; but then, no way! I was very energetic in organizing things. We planned out many comedy shows, spook comedy shows and various contests through our early years. We went around the neighborhood trying to sell tickets to whatever event we had planned. We never made much money, but it was all fun! We also loved to make go-carts out of old lawnmower wheels and wooden crates and so on. We nailed an old pair of gym shoes on the front of one and called it Little Louis’ Coffin because it looked like Little Louie was inside! Fun for us, but the adults probably scratched their heads a lot, wondering what would ever become of us when we grew up. We didn’t watch a lot of TV, but I can remember all the black-and-white programs that we did see: Bonanza, Flash Gordon, Perry Mason, 77 Sunset Strip, I Love Lucy, and many more. Our telephone was a rotary, of course, with a word for the prefix to the numbers. 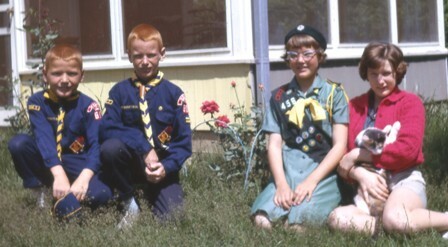 I can still remember ours: MOntrose 8-7379. My dad always bought Pontiac cars as far back as I can remember, and my Grandpa Dibble always bought Buicks. 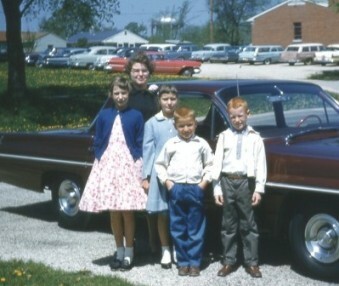 Grandpa Porowski had one of our used Pontiacs toward the end of his life. By fifth grade - about 1964 - the Beatles revolution was going full speed. I saw the first TV performance of the Beatles in America on the Ed Sullivan Show in 1964, and it made a big impact on me. The music seemed to hit home in my own heart, and I loved it. Before those years my mom always gave us crew cuts at home to save money. But when the Beatles came into popularity, my brother and I began growing our hair long like everyone else! Many of the sad songs the Beatles wrote hit home to my heart too hard, and I often got depressed about life in general, a depression that increased as I got older. When I was eleven I had a crush on a girl named Francis Anzalone and could hardly think about anything else. Nothing ever came of it, and she probably never knew how I felt about her! I remember having fun throwing snowballs at each other one winter day at school, until one that I threw hit her in the face. I cannot describe the heartache I felt, wondering if she would ever talk to me again. Ah! The pain of life! I am sure she recovered from the physical pain much quicker than I did from the emotional. My Grandpa Porowski was an artist. 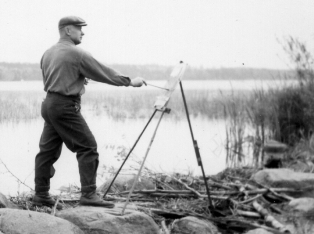 Though he worked all his life as a machinist in Chicago like many Polish immigrants did, he spent his spare time and vacations doing oil painting in the wilderness areas around Chicago, Wisconsin and Indiana. I guess I inherited his talent for art. When I was five years old I began drawing. I can remember drawing pictures of the piano in our home when I was five. Because of the challenge, the interest, the beauty in art and because of the praise I got, I continued. When I was seven years old I made “How to Draw” books so others could learn. I still have some of them, since I discovered them in my dad’s stuff after he had died: “How to draw army men,” “How to draw cartoons,” and so on. Silly drawings, but how intelligent I felt! My classmates and I loved to play sports with our gym teacher Mr. Townsend. In the warmer months he often came out before school to play football with us until the bell rang for classes. As I look back on that, I don’t think he realized how special those times were to me. I loved gym class most of all, always loving to compete and show my skills in any way I could. I almost always came in second in running races to a guy named Ricky Smith. Perhaps that affected my heart, my determination, my competitive spirit in more ways than I can imagine. My brother and I didn’t have bicycles until 6th grade. You would find us running to wherever we had to go, often beating our friends who had bikes because we knew all the shortcuts around the neighborhood. 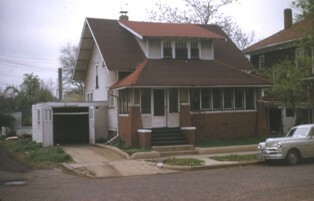 When I was in 6th grade my Grandpa and Grandma Dibble moved to Wheaton where we were still living. Grandpa had been asked to be an assistant minister in the local Methodist church. After they moved I often rode my bike to their home. It was a place where I received love and a sense of stability in a way not found much at our home. Well, we made some great friends in Wheaton. Jeff Waldrop was one, who lived on Woodlawn. I remember often going to his house and looking in the front door, pushing at the screen on the door every time, until after a few months it curved in. I remember most front door screens in the neighborhood looking that way. Charlie Devere lived up on the way to Sunnyside, the local store on Roosevelt Road where we used to buy - and steal -candy. I remember us listening to his sister's record "Wild Thing" and wondering how in the world she could like it! Ricky Smith lived on Pierce. He was the sports star, first in almost anything we competed in, like his brother Bruce who was one or two years older. I respected them very much, especially Bruce because he seemed so much older and more mature and hard-working. They were the guys who seemed to have the sports equipment I could only dream of having like the Wilson A2000 baseball mitt and real spikes instead of our cheap gym shoes. I suppose a mark of greatness is showing skill even with the worst of equipment. Perhaps that motivated me some. And I remember going to a movie with a bunch of guys for Ricky’s birthday one year. We got some hard candies, and while watching the movie, one got stuck in my throat for half an hour until it dissolved! There I sat in the darkness, saying nothing, thinking I was going to choke to death. What a way to go! Well, I survived to talk about it....!